Properly positioned some elliptical style machines cannot fit comfortably under the desk for taller people. One great adaptation as demonstrated in the video below by Physical Therapist Bob Schrupp – put height under the front end of it. This makes it super comfortable for sitting and will change the angle enough that it should make the difference if you are a taller person and want to put the elliptical under your desk. Many of the under the desk elliptical machines are also durable enough to take your full weight to get a real cardio workout. Another version has resistance bands with handles attached to the pedal base. These allow for upper body exercise to train your arms while you are also getting a cardio workout at your desk. 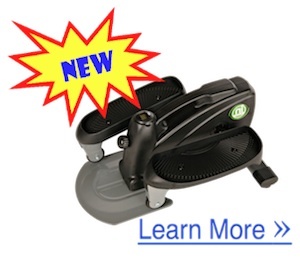 You might also be interested in the NEW Stamina InMotion Compact Strider. The Stamina In-Motion Elliptical Trainer has the ability to be used both seated and standing. This particular model has sold thousands and continues to be a best seller in the market. The negative feedback seem to be mostly about durability. The good news is – if you are concerned about function and durability there is always the manufacturers warranty as well as options of extended warranty purchase plans. 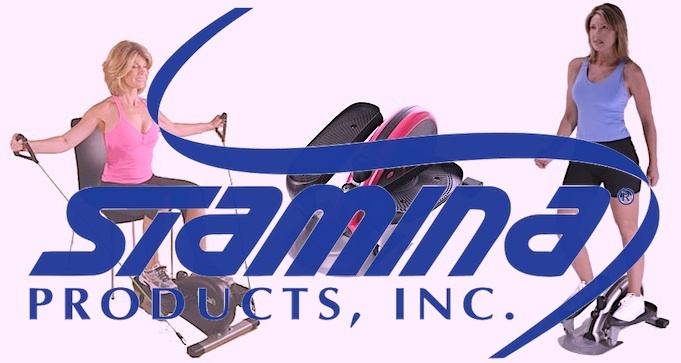 Another Mini Elliptical Trainer by Stamina comes in three colours and is also for seated or standing. Again with a 4/5 star review and thousands in sales. Adaptations for this machine have been for under the desk at work, beside the desk for standing exercises, and for seated during leisure times like watching the television. Using an elliptical will help the blood to pump through your legs to keep you alert and burn calories while you are seated during other tasks. The third style of elliptical also is manufactured by Stamina and similar to the above under desk style elliptical but has the resistance band additional option. 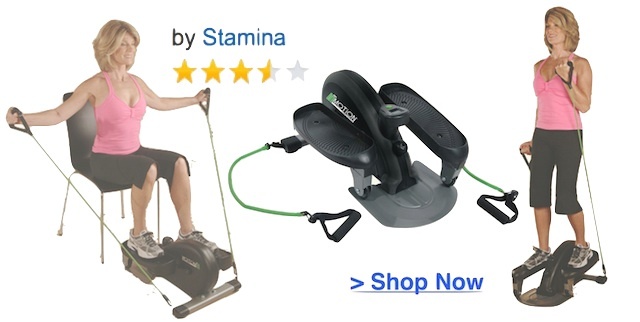 Although this one has the added functionality of being able to exercise your upper body at the same time, the reviews have given it only 3.4/5 stars. Common complaints are it is heavy for being called portable – although I would interject that a quality product built to hold a pedalling human should have a fair amount of sturdiness to it. 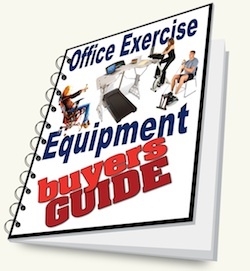 The raving reviews were from people who have used this successfully at work and at home. 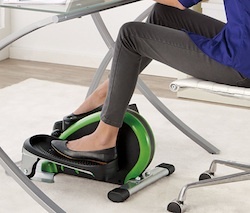 The people using it at work happily pedal away while answering emails and tending to daily tasks. Another person happy to have this elliptical under their desk because they had damaged their Achilles tendon and were unable to walk but reported they were able to comfortably get exercise using this machine. There are further weight restrictions of 250lbs. If you weigh more than that, then you will not be able to stand on it until you have dropped the excess weight. Fortunately it is still perfectly suited for seated exercise and you can still get full use out of the arm exercises from the bands. The pricing averages at around $100 per unit and all three units are focused on lower body conditioning and cardio activities. They come with adjustable tension controls so you can vary your workout or adjust for your current fitness level. There is also an electronic monitor that will keep track of the number of strides, total them per minute, and tally up your time exercised. This is great for the ‘record keeper’ type of person. If you want to track your calories burned or want to estimate how long it will take to reach your goal weight – this will help you do it. The frame is made of steel for durability but does add some heaviness to the unit. Although still small and portable. With a weight restriction of up to 250 lbs, you can also use this for standing exercise. The range of motion isn’t the same as a full sized elliptical machine so the stride is much shorter so be cautious of shin splints developing. Used with the resistant bands attached you can increase your cardio and your calories burned during the same time period. Also when used at work at your desk, this will help to keep your shoulders and arms mobilized throughout the day. For the dollar value you get a pretty good return. The adjustable resistance allows for a good workout and if you use it standing you also work your core muscles. 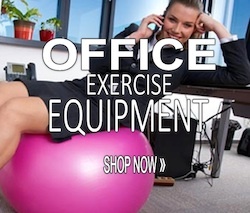 Because it is portable you can tuck it under your desk so you can get your legs moving while you are working, then pull it out to the side and stand for a more intense workout. The motion is reversible so you can pedal in both directions. Simple to put together and very quiet so your workmates shouldn’t get too peeved at you – except for being jealous that you have something they want. The digital controls aren’t particularly accurate. Must be very careful when using it upright. Be certain it is in a place where you have flat surface. Also because there are no handles like on a regular elliptical you are on your own to balance. This coupled with exercising using the bands could put you off balance. As mentioned in the PROS this also allows you to work your core, but if you find you are off balance, you might want to work up to standing on it over time. I have the InMotion Elliptical Trainer and the InMotion Rower. I’m using both, but I skip a day once or twice a week. Sort of like in resistance training. So far, I like them both. I’m just waiting on some barbells to come in now for curls and cross curls.